High net worth borrowers who buy a home and finance it with a mortgage may think their assets are sufficient to qualify for the loan. However, they must show an income stream to qualify for the mortgage. The income stream can come from the borrower’s assets, and there are specific stipulations regarding the income stream. 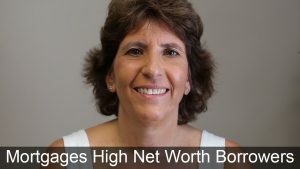 In this video, Mary talks about the process of getting a mortgage as a high net worth borrower, especially for those borrowers who are retired. Hello, I’m Mary Catchur. I’m the owner of Marimark Mortgage. Each month, I like to talk about topics that arise in the course of taking a loan application. Earlier this week, I had a call from a retired high net worth borrower. Of course, because he had significant assets in the bank, he thought the loan process would be very simple. However, what you need to realize is that even if you have a lot of assets in the bank, the underwriters look separately at assets versus income. Assets alone do not qualify you for the mortgage. You still have to demonstrate that you have an income source. This is doable with a high net worth individual by creating an income stream from the assets that they have. Conventional loans have certain requirements that must be met, though, to create that income stream. The distribution from the retirement funds has to be already being received, at least for one month. You also have to demonstrate that you have sufficient assets in the account to receive that distribution for at least three years. And in most cases, the lender is going to require a letter from the plan administrator indicating that these are ongoing distributions. So, while these are not obstacles you cannot overcome, it’s a good thing to know about them at least in advance, so you can prepare and have that initial distribution made before you begin the loan process. Speak to your plan administrator and give them an understanding of the type of documentation you’re going to need from them, and make sure that your assets account has enough funds in it to support that through your continuance. If you fit this situation and would like to hear more on this topic, please give us a call at 813-910-8020, or visit our website, MarimarkMortgage.com.